The Cumberland Hotel enjoys a thriving cosmopolitan atmosphere and offers an extensive choice of restaurants and bars. Whether in London on business or purely for pleasure we have been providing visitors with the finest service for over 60 years. 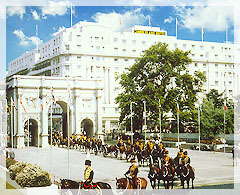 This landmark hotel, located on Oxford Street, is in the very heart of London overlooking Marble Arch and the green expanses of Hyde Park. From this enviable location visitors can easily access all the fantastic shopping, theatres and visitor attractions that the capital is famous for. Once inside the hotel has much to offer with 900 bedrooms, Including Leisure, Superior and Executive Club rooms and suites. The large bustling lobby and mall provide a convivial meeting place, whilst the range of restaurants and bars is unsurpassed in the area. All of the rooms have been designed to meet the needs of the modern traveller with all the facilities you will need at your disposal.